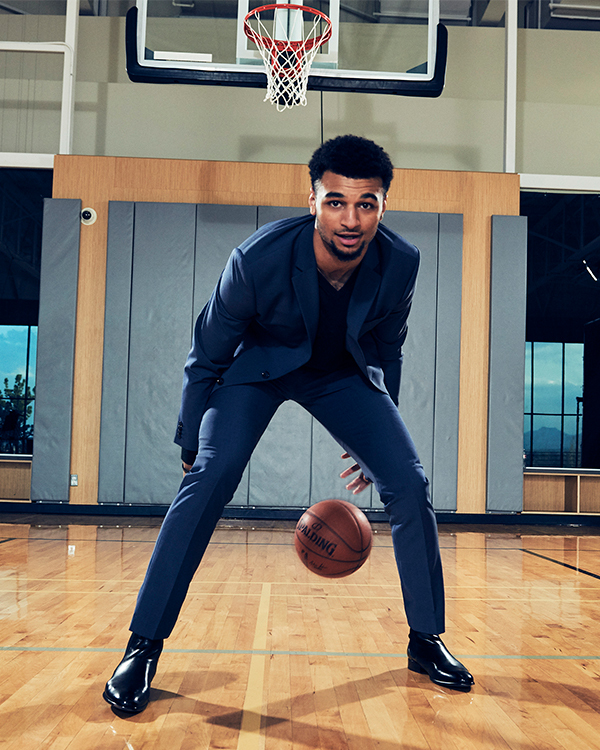 If you saw Jamal Murray in our 2017 NBA Game Changers shoot, you know the 20-year-old point guard looks good in a suit. And a topcoat. And a denim jacket. And sure, that’s partially because he’s 6’4” and, in addition to playing professional basketball, genuinely enjoys spending QT in the gym (sigh), but it’s also because he’s game to try new things with his wardrobe. 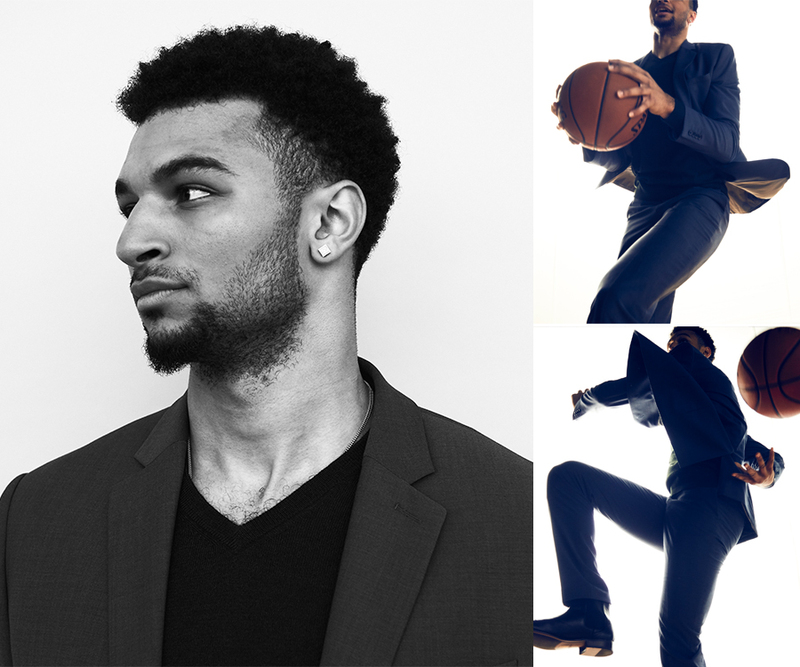 Jamal will be the person to tell you: having a positive attitude and open mind is the key to everything—on the court and in your closet. Case and point: during his Express shoot, Murray discovered a slew of new styles he’d never tried before, from the camel topcoat (a men’s style essential) to double denim (a move every guy should master). That friends, is the power of yes. Get to know the wise Murray through our Q&A with the pro, below. Express: How would you describe your personal style? 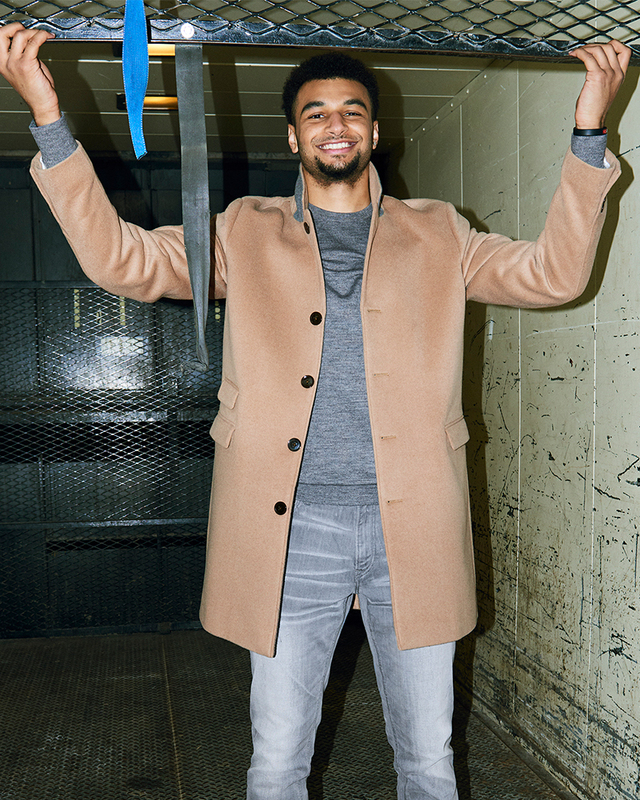 Jamal Murray: I’m a laid back type of guy. I like something that’s clean and light. I don’t like anything too flashy. I’m excited to be doing this partnership with Express because I feel that’s their vibe. Just simple clothes that look good. Was there a style icon you admired growing up? Honestly, I didn’t really pay attention to my style until recently. I didn’t have a lot of money growing up so I just wore whatever. I wasn’t really exposed to the style world until I got into basketball. Now, I pay a little bit more attention to it. If I have to go to an event or I’m representing my team on camera, I want to make sure I look on point. I enjoy clothes now, actually. More than I ever did before. Why is looking your best important in your profession? It’s important to set an example. You know, we’re role models. I might not be going to an office and wearing a suit every day, but I still need to look professional. Even if I’m in sweats, there’s a way to wear them and still look polished. Whether it’s matching the colors or wearing a nice pair of sneakers, it’s about being comfortable but recognizing that, hey, people are watching me and I need to look good. I have sweats on right now, you know. I’ve got my Yeezys and a nice black sweater from my shoot with Express, and it makes the black sweats look a lot better and more put together. It doesn’t have to be complicated. Does looking good help you get into the competitive mindset? Yeah, I mean, I think the idea that ‘when you look good, you feel good’ applies to everything. Even if you’re going out to dinner or going to an event or something. Your energy and your spirit improves when you take pride in your appearance, and that affects how people perceive you. Do you have a favorite look or item from your Express shoot? Yeah, the tan jacket was definitely my favorite. It was simple and warm but also made the jeans I wore look a lot nicer. I have a jacket like that in black but I didn’t think to try tan until my shoot with Express. It’s fun to have an opportunity to try on different looks and see what rocks me and what doesn’t. I also loved the navy suit that I wore with the black sweater underneath. I’m not much of a tie guy so I appreciated that look. And the suit fit me pretty well right off the rack. Everyone obviously needs a little bit of tailoring but it wasn’t too far off. Other than a suit, what’s another way for a guy your age to step up his style a little bit? I think just throw on some jeans and a blazer to make it a bit nicer. Keep it simple or, you know bring your own kind of swagger to it. Personally, I’m kind of a sneaker guy. I wear sneakers with almost everything. Except…you did wear some dress shoes in your Express shoot! Yeah, yeah, I did. Let’s just say I’m getting used to all that. I’m having some growing pains but I’m getting there.